At Seabrook High It’s Zoms vs. Poms in Disney Channel’s Newest Original Movie! 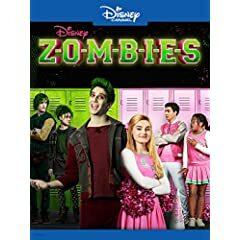 ZOMBIES On Disney DVD April 24th. Featuring Exclusive Bonus Content Including Bloopers, Deleted Scenes, Zombie Survival Guide to High School and More! Disney's "ZOMBIES" is a music- and dance-filled story set in the fictitious world of Seabrook, a cookie-cutter community brimming with perky conformity 50 years after a zombie apocalypse. Today, the zombies pose no threat, but are required to live in Zombietown, an isolated, rundown community infused with their unique creative spirit.